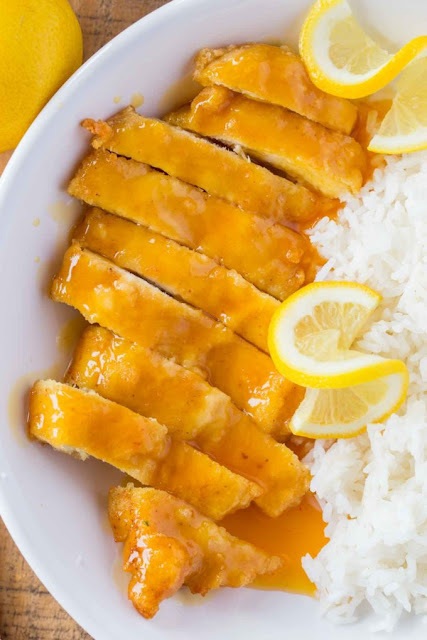 Chinese Lemon Chicken Is The Classic Chinese Takeout Recipe Cooked With Coated Chicken Breast In A Sweet And Sour Lemon Sauce In Just 30 Minutes. Chinese Lemon Chicken is a close match to the super popular Orange chicken in flavor but not presentation. The classic orange chicken is made with chunks of dark meat chicken that are tossed in a sweet, tangy and spicy sauce which lemon chicken is a fried chicken cutlet that is sliced and covered in a freshly made lemon sauce. Slice the chicken breasts in half butterflied into two thinner pieces each. To coat the chicken add the egg, salt, pepper and oil into a bowl and whisk together in a large bowl. In a separate bowl, add 1/2 cup corn starch and 1/4 cup flour and mix well. In a large frying pan or a wok, heat more canola oil in a wok 375 degrees (medium high heat). Dip chicken pieces in the egg mixture, then dredge in the flour mixture. Fry the chicken for 3 to 4 minutes or until golden and crisp. Remove the chicken from the pan, then drain the oil. Add the lemon juice, sugar, water and remaining 1 tablespoon cornstarch to the pan and whisk to combine. Cook until thickened and smooth. Slice the chicken into thin strips then serve with lemon sauce poured over. 0 Response to "CHINESE LEMON CHICKEN "